A group of military and civilian leaders “break ground” on the Gulf Outlet by detonating dynamite in a coastal forest. US Army Corps of Engineers. We often think of maritime transportation chokepoints as locations where trade flows are constricted or obstructed: the Panama Canal, narrow straits, shallow river mouths, and the like. But the infrastructure projects built to facilitate transportation may generate ecological chokepoints. These are sites where human intervention inhibits or eliminates critical forms of ecological connectivity. By analyzing the dialectical relationship between transportation and ecological chokepoints (that is, how concerted efforts to overcome one can intensify the other) through three sites—a hulking river control structure, an ill-fated shipping canal, and a massive pile of rocks—we can consider how this chokepoint dialectic produces socioecological contradictions at a regional scale. Transportation networks utilize waterways to move commodities like corn, soybeans, coal, oil, and automobiles in massive quantities. However, landforms and biophysical processes such as sandbars, shoals, land bridges, and isthmuses present barriers to circulation. Infrastructures like canals, locks, and dredging machines work to decouple transport systems from geographical constraints. Similarly, coastal ecosystems like those of Mississippi River Delta depend on the river’s capacity to transport and circulate fresh water, millions of tons of sediment and sand, seeds, and billions of animal eggs and larvae. A sustainable delta requires multiple pathways to distribute water, nutrients, and sediments into its alluvial plain. When these circulation patterns break down, ecosystems undergo dramatic changes and the delta’s landmass itself rapidly erodes. 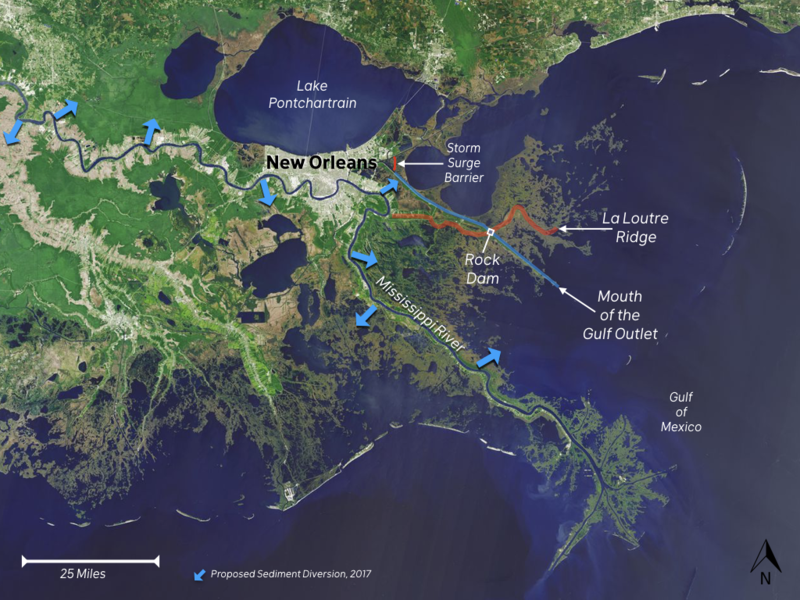 This catastrophe is currently unfolding in coastal Louisiana, placing its communities, its infrastructure, and its ecological bounty at risk (Figure 1). Fig. 1: Historic and projected coastal land loss in Louisiana, 1932-2050. US Geological Survey. The infrastructures meant to overcome maritime transportation chokepoints in the region create ecological connection and disconnection. Levees, for example, diminish the delta’s porosity and connectivity across space. Canals, on the other hand, generate connectivity between fundamentally distinct ecosystems—bringing salt water into freshwater swamps or injecting fresh water into a salt marsh. When the landscape is modified for transportation purposes, a very specific configuration of connectivity is thus rendered—one intended to intensify the flow and circulation of commodities through the region’s waterways. The dialectic between transportation and ecological chokepoints also gives rise to confounding politics. As maritime infrastructure and ecological flow became more entangled, complex political controversies have arisen between port agencies, water engineers, the fishing and oyster industries and delta communities. Zeroing in on these layered chokepoint effects reveals the contradictions now materially embedded in the socio-ecology of the region. Establishing and maintaining a maritime transport system—not to mention a major urban center on the edge of a hazard-prone river delta—requires continuous infrastructural and ecological interventions. The mouth of the Mississippi River is an obligatory point of passage between Atlantic shipping lanes and the earth’s busiest and most expansive inland navigation system. River engineers and their clients in the shipping industry have sought to capitalize on the geographic centrality and connectivity conferred by the Mississippi’s massive network of tributaries and distributaries, while fighting against the troublesome consequences of this connectivity. The river deposits sediment near its mouth, forming sandbars and shoals that threaten access for large ships. In the spring, the river swells with snowmelt and floodwater, periodically inundating the region with waters described in folk songs as “too thick to navigate, too thin to plow.” Conversely, late-summer droughts can lower water levels in the river dramatically, stranding ships and barges and threatening municipal water intakes with saltwater intrusion. Figure 2: The Mississippi and Atchafalaya Rivers, and the Old River Control Structure NASA/USGS. Twentieth-century engineers concluded that the best way to float large ships through the ports along the river’s lower reaches was to fix the river channel in its present course with levees, choking off the hundreds of waterways that formerly carried fresh water and sediment into the alluvial plain. One consequence of this practice is that the river’s present distributary channel and delta lobe extends—narrow and serpentine—to the edge of the continental shelf (Figure 2). 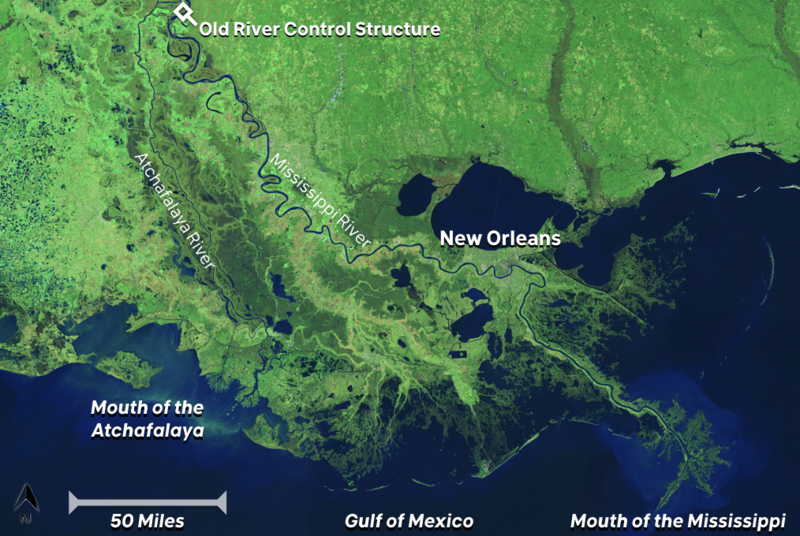 Nearly all of the sediments, nutrients, and freshwater that formerly nourished and sustained the delta is confined to a small area directly around the river’s multi-mouthed terminus in the Gulf of Mexico. Other than a few flood control outlets, thousands of pathways that the river historically utilized have been eliminated. The delta is not as porous as it once was. This has transformed the basic ecological and geological processes of the landscape, bringing the ocean to New Orleans’s doorstep. Figure 3: Historic delta lobe formation in the Lower Mississippi River Delta. The ecological chokepoints of the Lower Mississippi have an additional and potentially calamitous effect: by constricting the river’s flow and forcing it to follow an inefficient pathway to the Gulf, the entire lower river becomes increasingly prone to avulsion. An avulsion occurs when a river becomes attracted to a pathway with a steeper slope to the sea and suddenly shifts its course, usually during a flooding event (Figure 3). John McPhee’s essay, “Atchafalaya,” recounts how the U.S. Army Corps of Engineers built the Old River Control Structure, designed to prevent the river’s main channel from jumping to an alternate pathway (Figure 4). Such a shift would drop water levels on the Mississippi’s present channel severely, rendering useless riverborne shipping and the massive port and petrochemical facilities it serves. New Orleans’ position at a chokepoint in the global flow of goods and capital, its raison d’être, would be undermined fundamentally. Therefore, the Old River Control Structure is an ecological chokepoint that mediates the delta’s most fundamental processes, affecting ecological flow and transportation across a 4,000 square mile area. Managing the river through a multitude of distributary chokepoints is only one strategy engineers have developed to counteract the chokepoint dynamic at the river’s mouth. In the 1950s, the Port of New Orleans began implementing a long-simmering plan to bypass the lower river entirely. It was disastrous. The Mississippi River-Gulf Outlet (MRGO) channel was promoted by maritime interests as the ultimate panacea to the sandbars, shoals, fog, and dramatic changes in river levels that have long frustrated shipping firms. 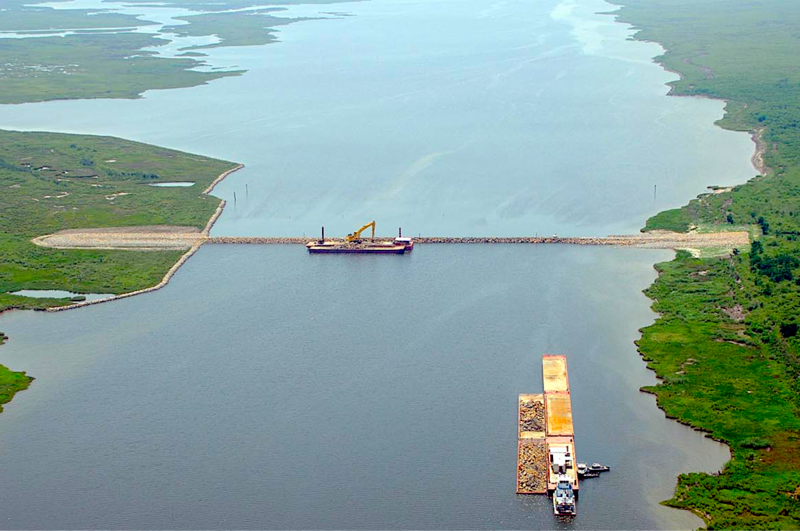 The Gulf Outlet was intended to bypass the lower 100 miles of the river, thereby enabling ships to enter the Port of New Orleans through a linear channel with consistent channel width and depth (Figure 5). The Corps of Engineers began dredging the 75-mile channel in 1958, detonating dynamite in a freshwater swamp forest just outside New Orleans (Figures 6.1 and 6.2). 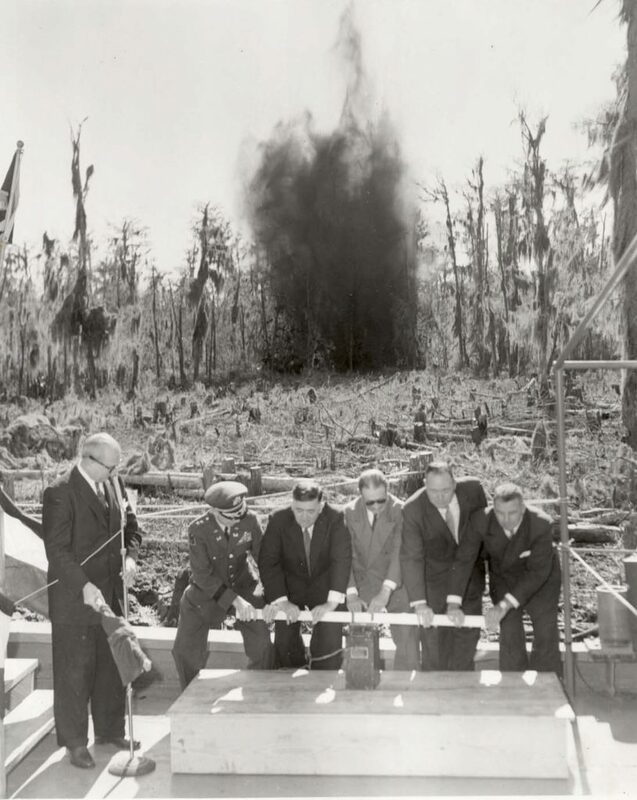 Figure 6.1 (left): A group of military and civilian leaders “break ground” on the Gulf Outlet by detonating dynamite in a coastal forest. Part of a wider plan to move the region’s main port facilities into an inner harbor within the city limits of New Orleans, the Gulf Outlet was an economic failure and an ecological menace. The soil conditions in the area forced engineers to constantly dredge the waterway, adding costs to a project that was obsolete on delivery. 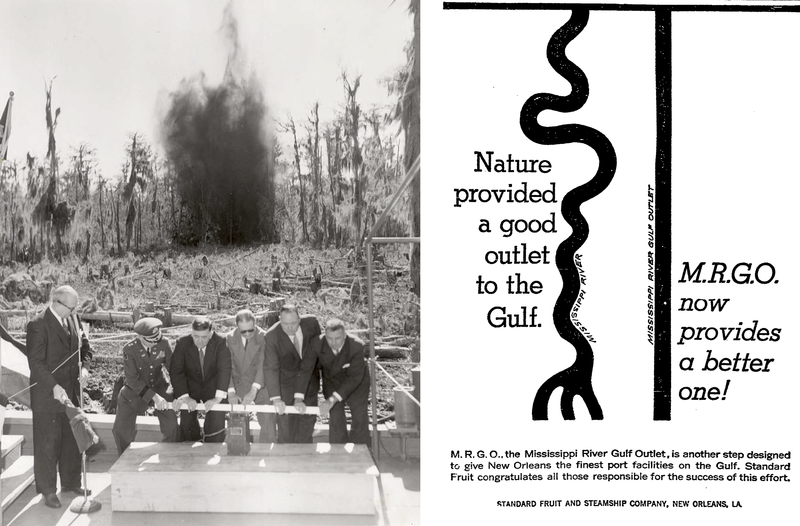 In a ten-year period following the engineer’s staged explosion, the Gulf Outlet transformed the average salinity in the surrounding estuary such that the cypress and tupelo trees visible in Figure 6.1 were no longer viable. Tens of thousands of acres of freshwater forests simply died. This was due in large part to the chokepoint effect the Gulf Outlet created on tides and storm surges. 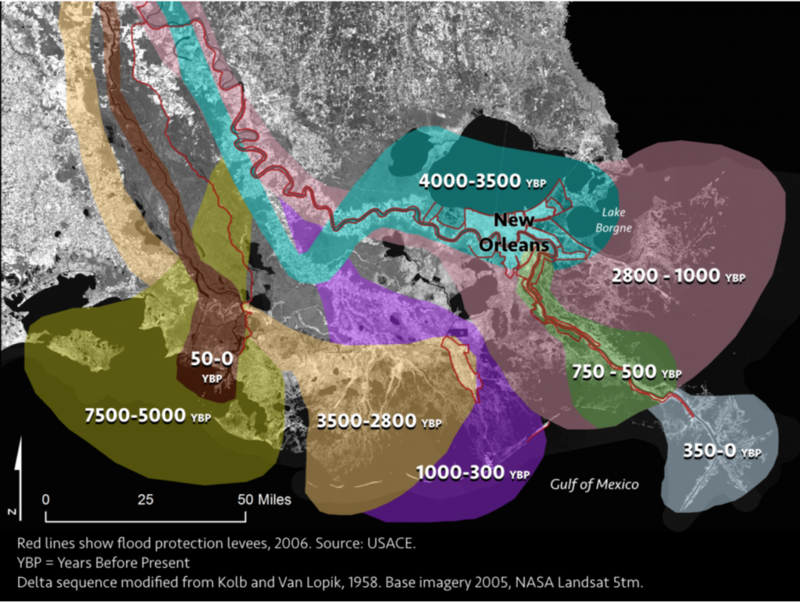 The flood protection levees along the Gulf Outlet concentrated storm surges, conveying them through landscapes adapted to fresher conditions. Hurricane Betsy in 1965 carried salty surge waters deep into the forests and into the city of New Orleans, catastrophically flooding many working-class neighborhoods. 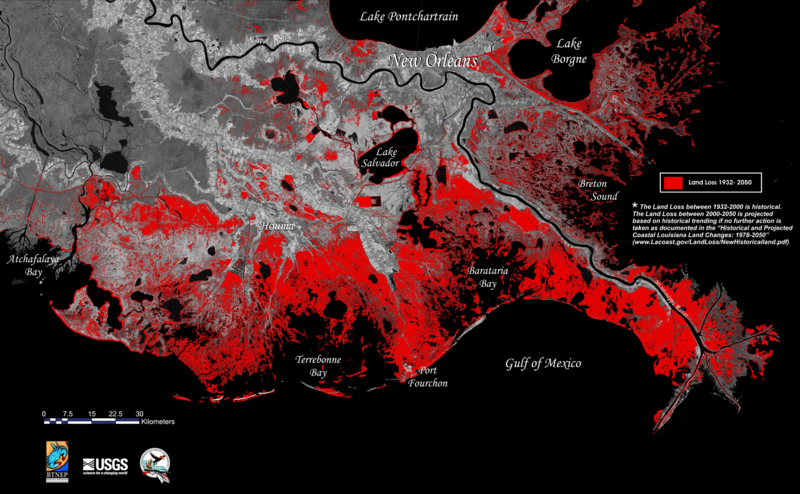 With the Mississippi’s fresh water and sediment trapped behind a multitude of riverbank chokepoints, the eastern flank of New Orleans was transformed from densely forested wetlands to open water and patchy salt marsh. In this unfolding sequence of chokepoint effects, the infrastructural work intended to overcome a transportation chokepoint (mouth of the Mississippi) generated a hydro-ecological chokepoint, a funnel-shaped infrastructural topography that increased flooding vulnerability in New Orleans, and transformed ecosystems across the southeastern Mississippi Delta. But ecological chokepoint effects can emerge in more surprising ways, which defy common notions of “natural” systems and what “degradation” implies. The Bayou La Loutre ridge is a sinuous stretch of slightly elevated land just outside of New Orleans. The ridge is a slowly eroding vestige of an ancient course of the Mississippi, a landform that owes it existence to the river’s historical tendency to move around—the sort of dynamic the Old River Control structure was built to prevent. The ridgeline extends eastward from the Mississippi’s banks just downstream of the city, snaking through the marshes that fringe the lower course of the river (Figure 5). The Gulf Outlet canal severed this ridge in the 1960s, generating a deepwater connection between fresh and marine ecosystems. The outlet’s ruinous effects came into full view when, during Hurricane Katrina, it funneled storm surge into New Orleans. Afterward, the ancient ridgeline became an unlikely site for environmental conflict. It also became an ecological chokepoint. In 2009, the Corps of Engineers dumped more than 300,000 metric tons of rock into the Gulf Outlet at the site where the channel had cut through the La Loutre ridge (Figure 7). A year later, they began construction of the largest storm surge barrier in North America across the same channel (Figure 8). The Gulf Outlet allowed saline ocean water to creep into freshwater ecosystems that the ridge once protected (thus compounding the effects of these areas being choked off from the river’s flows, as outlined above). In this sense, the rock dam was meant to create an ecological chokepoint to regulate water salinity (and thus ecological composition) over a vast territory. For the engineers, the pile of rocks promised to slow down coastal erosion in some areas and perhaps even help make coastal areas around New Orleans viable for the redevelopment of forests, which under certain conditions provide a buffer from storm surge for the city. Despite being a fairly minor topographical feature and despite the Gulf of Mexico’s small tidal range, the restoration of this ridgeline with a pile of rocks had direct effects on water salinity up to 60 miles away. The pile of rocks, despite its effect of restoring historic patterns of water salinity, received a mixed reception from local fishers. Soon after its completion, the dam itself became a fishing hotspot as speckled trout and redfish were pushed against the dam by the tide, constricting their ability to move up and down the channel that had existed for nearly 50 years. The fish were caught behind a chokepoint with no clear bypass. This abundance was also an ecological consequence of the Gulf Outlet. It just so happens that degrading saltmarshes tends to produce some of the most productive fisheries. But with the Gulf Outlet choked by rocks and salinity dropping in the area, fishers began to argue that marine species such as blue crabs, shrimp, red snapper, and speckled trout actually were becoming scarce. Some even demanded that the rock dam be removed, bypassed, or retrofitted to allow greater tidal and saline influence, despite the role of saltwater intrusion in accelerating coastal land loss. The Old River Control Structure, the Gulf Outlet, and the pile of rocks show the array of ecological and infrastructural forces that produce chokepoint effects in the Mississippi River delta. 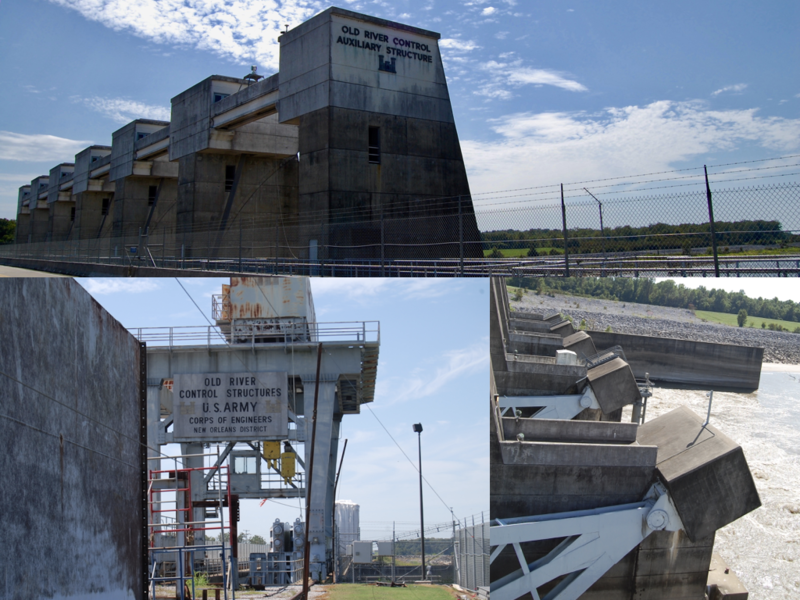 Engineers have worked for over a century to close off naturally occurring outlets of the Mississippi River. In resolving this maritime chokepoint problem, however, they blocked the flow of sediments and nutrients that had sustained the deltaic plain for millennia. Or, put another way, their interventions generated ecological chokepoints, which over time produced a contradiction: a major coastal land-loss crisis that is complexly intertwined with maritime shipping, coastal fisheries, and flood exposure for communities. The Gulf Outlet generated a chokepoint effect in tidal flow and storm surge in the nearby coastal estuary. This in turn transformed the estuary into a flood prone, salty, yet ecologically productive fishery. Fishing groups became dependent upon the new ecological baseline, and the politics of resolving these contradictions has become almost dizzyingly complex. This brings us back to the rock dam outside of New Orleans. The most vocal opponents of the plan to reintroduce the Mississippi into the delta are the same fishers who, despite the contradictions, were pushing to remove the rock dam across the Gulf Outlet. The somewhat ironic ecological abundance of a degrading saltmarsh is being weighed politically against the survival of the region’s major cities. How these cities, ships, fisheries, sediments, and salt particles are configured in coastal Louisiana hinges upon the negotiation of both maritime and ecological chokepoints and the contradictions that emerge in the process. The stubbornness of built infrastructure and the extreme dynamism of the delta environment converge at these dams, diversions, floodwalls, and sandbars: ecological chokepoints whose material forms and fraught politics will determine the future habitability—and indeed, existence—of the Mississippi River Delta.